There are some whiskies that if you simply sniff, swish and move on, you may not catch what makes them enjoyable. This Deanston is one of those which initially had quite an unassuming character, yet if you didn’t give it a proper chance, would miss out on a rather companionable dram… it also just so happened to kick of our 2nd Whisky flight with a “lighter touch” at Singapore’s The Single Cask. Even when revisited after sampling the other whiskies, there was something simply ‘comfortable’ and ‘comforting’ about this one… and I found myself coming back to it for a final sniff, sip and sigh of happiness. Nose: This is a very natural whisky that is added to, but not burdened, by wood influence. We have just enough vanilla pod and bruleed banana that complements the spirit’s masses of estery green fruit. It is on the whole light and exuberant, showing the freshness of green apple peels but is also anchored by malt notes and linseed oil. Palate: The wood has more to say here, with a growing hot spiciness and black pepper. But look past that and find tart berries, pollen and – surprise – lots of lilies. Finish: Vanilla and more charred spiciness linger on. I certainly didn’t catch any oil or lillies but overall wouldn’t disagree… except for the finish lingering… not in what we experienced but you can also see there wasn’t much left in the bottle! Particularly with lighter whiskies, I find oxidation can be a factor in shifting some elements. 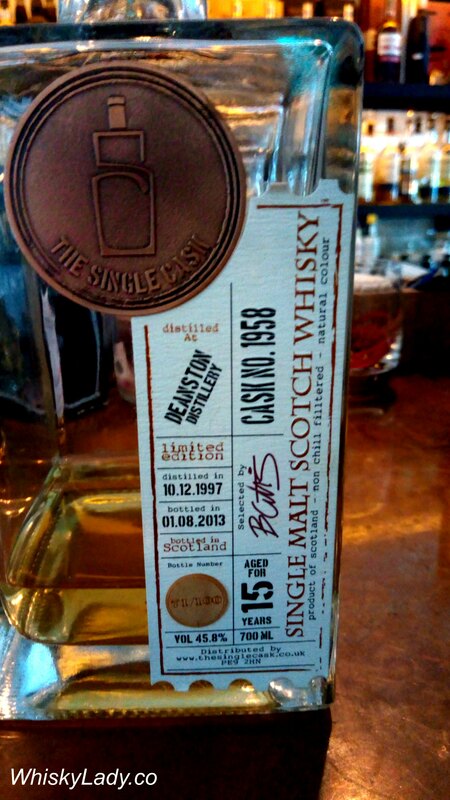 This entry was posted in Highland, Scotland and tagged Deanston, Independent Bottler, Singapore, The Single Cask by Carissa Hickling. Bookmark the permalink.